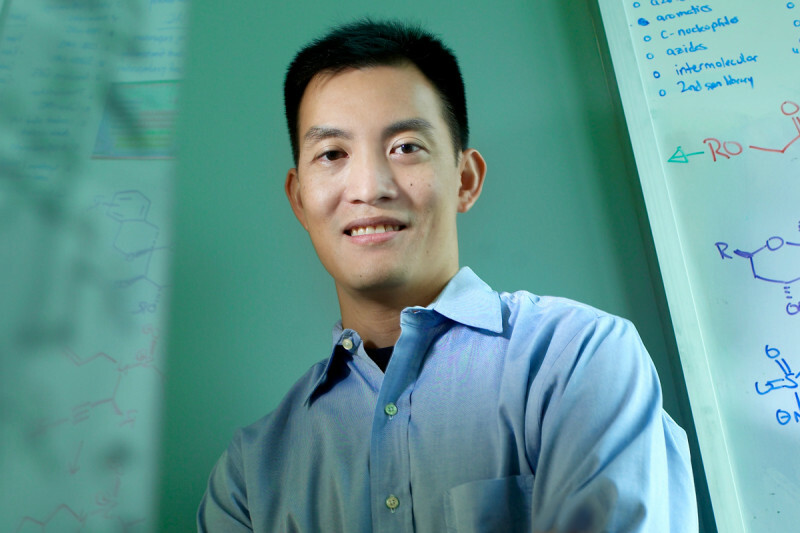 Chemist Derek Tan studies diversity-oriented synthesis and rational drug design for chemical biology and drug discovery. We spoke with Dr. Tan in 2007. I grew up in Rochester, New York, where both of my parents were research chemists at Eastman Kodak. Because of the weak job market then, they told me, “Whatever you do, don’t go into chemistry.” Of course, the best way to get your kids to do something is to tell them not to! When I was in college at Stanford, I started a research project with Dale Drueckhammer, a bioorganic chemist who is now at Stony Brook University (part of the State University of New York). His lab used enzymes to conduct reactions that would otherwise be difficult for chemists to do in the lab. There, I found organic chemistry to be very satisfying. It allowed me to create materials that had never been made before, that had never been seen on the planet. I was also attracted to the fact that there is a great deal of artistry in the field. In 1995, when I was choosing a graduate school, chemists were becoming increasingly excited about tackling biological problems. I went to Harvard for my PhD because I knew I’d find many inroads into biology there. I joined the lab of Stuart Schreiber, who was well known as an organic chemist who used his skills to bring new light to biological systems. We were interested in identifying new small molecules that could be used to probe complex biological processes by turning on or off the functions of individual proteins involved in those processes. To do this, we used combinatorial chemistry techniques, which involve mixing and matching pieces of molecules and assembling them in different combinations, to synthesize a collection, or “library,” of more than two million small molecules. This library was then screened against a variety of biological targets to identify new probes. After graduate school, I wanted to solidify my training in organic chemistry while maintaining connections with biology. I chose to do my postdoctoral fellowship with Samuel Danishefsky, an organic chemist in the Molecular Pharmacology Program here at the Sloan Kettering Institute. Sam has a fantastic reputation for trying to advance medicine through the molecules that he synthesizes. In Sam’s lab, we developed the first chemical synthesis of an antibiotic called guanacastepene A. This small molecule is produced by a fungus and has an unusual architecture. It presented us with a challenge in terms of both chemically synthesizing it as well as exploring its biological activity more deeply. Later, once I completed my fellowship and began to look for jobs, I chose to stay at Sloan Kettering because I sensed a great commitment to chemistry and chemical biology among the leadership in the institute. Since then, we’ve continued to build in these areas; I think we’ve put Sloan Kettering on the map now in terms of chemistry. The biomedical environment here also meshes perfectly with my own research interests, which focus on identifying new small molecules that can be used to study biological processes and to evaluate new therapeutic targets. In my lab, we take two different approaches. In some cases, we can use detailed structural and mechanistic information about individual biological targets to design small-molecule probes. In other cases, we screen small-molecule libraries to discover probes. The molecules we synthesize are based on natural products — molecules produced by microorganisms, plants, or animals. Many natural products have potent biological activities, and the origins of many anticancer and anti-infective drugs can be traced to natural products. The aim of our work is to find potential ways to benefit from that track record of biological activity while providing rapid, efficient ways to produce small molecules. We’re now involved in a number of collaborations here to screen small-molecule libraries against a wide range of biological targets that are implicated in cancer. One collaboration, with Luis Quadri [then at Cornell], has led us to develop a number of novel antibiotics that inhibit enzymes used by pathogenic bacteria, including those that cause tuberculosis and the plague. We’re now testing the potential therapeutic activity of these compounds as antibiotics in mice. Coming in, I never thought that we’d be doing work on antibiotics, but now it’s a big part of our lab. Jim Leighton, a chemist at Columbia University, once told me, “A lot of people are going to ask you, ’What are you going to be doing in five years?’ The most exciting answer is, ’I have no idea; we’re going to see where the science leads us.’” That’s very much what’s happened for us. A more personal advantage to being here is the running scene in New York City. I belong to a local club team, and I co-captain Memorial Sloan Kettering’s Corporate Challenge team. That has been a great way to meet people in the Center whom I’d never meet otherwise. And running is a great outlet. If there’s a pressing problem, sometimes it’s good to get away from the office and go for a run. You may see things in a new light. You never know when the answer’s going to hit you.